Remember when you couldn’t wait to get outside and spend all day playing? More and more, today’s children are missing out on the simple joys of building a fort, jumping a creek, picking honeysuckle, or just exploring at will. And play isn’t all they’re missing: such activities provide enrichment and experiential learning no TV show or video game can replace. What can parents do to get their kids unplugged and out-of-doors? 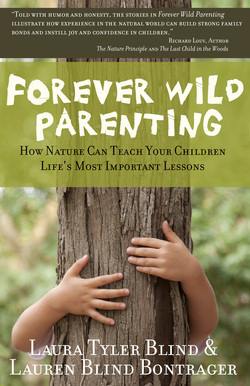 Forever Wild Parenting is filled with inspiration and practical guidance for parents who want their kids to have an active, enriching childhood. Environmental educator Laura Blind and her daughter Lauren Bontrager paint a lively picture of the possibilities with their unforgettable personal stories of family togetherness, rollicking adventure, and invaluable lessons learned. Each story brings to life the values that every parent wants their kids to develop and take with them into adulthood. Fun activities and opportunities for reflection at the end of each chapter give you all the tools you need to create your own “wild” experiences for the whole family! • Deepen your family bond through healthy outdoor fun. Hot off the press...Get Your Copy Today! Parent.....Grandparent.....Teacher.....Boy Scout or Girl Scout Leader.....Coach....Outdoor Educator.....for all those who fondly remember those adventure-filled childhood days of playing outside, this book is for you. Have you been noticing that the younger generations aren't getting outside as much as you did when you were a kid? This book will encourage parents with practical and creative ideas of how to get outside and make memories their children will never forget. A great baby shower gift, Mother's or Father's Day gift....and especially those "I was just thinking about you." gifts for a special person in your life. You'll be laughing and learning from the stories you read out loud together! Enjoy your next adventure outside!